Truck graphics succeed because they can turn a company’s name into a household name. Tasks that contractors already undertake – driving to pick up supplies, going through a drive-through for lunch, or heading back to the shop – turn into mobile advertising and branding opportunities. 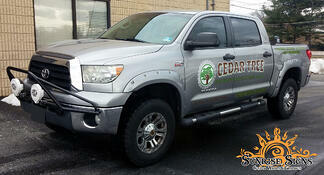 Therefore, when Cedar Tree Construction sent us its representative with a 2006 Toyota Tundra pick-up truck, a consultation made it clear rather quickly that construction contractor truck graphics for South Jersey were the way to go.